Liverpool have an issue this summer, and that issue is whether or not to sell Luis Suarez. Every other decision they make about player personnel is secondary, partly because of the amount of money involved, and partly because of the impact Suarez has on the entire team when he’s on the pitch. Before addressing the question of whether Liverpool should sell directly, I want to take a look at Suarez’s production. Fans on Twitter have been comparing him to Falcao, Cavani, Ibrahimovic, and Lewandowski as one of the world’s best forwards. Despite this year’s goal tally, I find myself sceptical of those comparisons, but was happy to look at the data and see what it had to say. Let’s start with the good. 2nd in the Premier League in goals. 1st in Shots per Game. 3rd in Key Passes per game. 1st in successful dribbles per game. Suarez was a handful and then some. Now for the bad. 1st in the league for being dispossessed. 2nd for turning the ball over. 3rd in Offsides per game. Great key pass numbers, but only 5 assists on the season. A 76.6% pass rate. (For comparison, Mata and Hazard were both over 85%, RVP was 80.2%.) A 12.2% conversion rate on total shots. This season Luis Suarez was really good at creating offense for himself and his teammates. At the same time, he was surprisingly bad at turning that offensive creation into goals. Judging players on just one season leads to bad decision making. Let’s take a gander at the 2012 model as well. Fewer key passes. Similar turnover and dispossession rates. Worse passing, fewer shots per game, and a far worse conversion rate. And by far worse I mean a non-penalty conversion rate of 8.6%, which is a horrific, season-killing number. Compared to last year, Suarez’s 2013 was amazing, but part of that is because last season was so bad. Here are the two sides of the commemorative Luis Suarez coin. 1) He creates a lot of offense. Side 1 is clearly very good. Though the media rarely focus on it, side 2 is actually quite bad. Liverpool averaged the most shots per game of any team in the big 5 leagues last season at 19.4. That’s an outstanding feat, and it’s more than Bayern Munich, Barcelona, and Real Madrid. But did they score the most goals? No, not by some distance. In fact, they were 4th in the Premier League alone. The reason for this is because their attack was inefficient, and Suarez is a big reason for it. It came as a surprise to me, but systemically, Liverpool create about the same number of shots with and without Luis Suarez in the lineup. If shot creation is equal with and without Suarez, the only way they can score more goals is by becoming more efficient. And Luis Suarez is the most inefficient superstar forward in the world. What I’ve done here is strip out all of the penalties the big names have taken over the last two seasons, and looked at their Shots on Target percentage as well as their conversion rate for total shots. The reason for this is that penalties are scored at about an 80% average and basically always on target, so taking a bunch of penalties adds a lot of noise to normal goalscoring rates. I tried to rank them from least to most efficient at scoring goals from normal play, so the differences are fairly easy to see. Putting shots on target is the minimum you ask from a forward, but it’s certainly something that can be considered a skill. Converting shots involves some element of luck (does the keeper save it, etc), and some systemic effects (Barcelona create more tap-ins than anyone because of their passing), but there’s an element of skill and shot selection there as well. As you can see, compared to these guys, Suarez is dreadful. His average conversion rate over the two seasons is about 5% lower than the average for elite players. At the other end of the scale, Lewandowski is amazing. If Bayern get him for less than United paid for RVP, something is seriously wrong with the world. What’s interesting and somewhat unexpected, is that Ronaldo is also comparatively bad. This is largely due to shot selection. He averages 6.9 shots per game, a crazy number. Ronaldo’s physical gifts and dribbling skills give him the ability to create his own shot more than anyone else on the planet, but he’s so confident/trigger happy that he will literally shoot from anywhere in the final third and hope for a goal. Even then, he’s still considerably better than Suarez at converting chances. 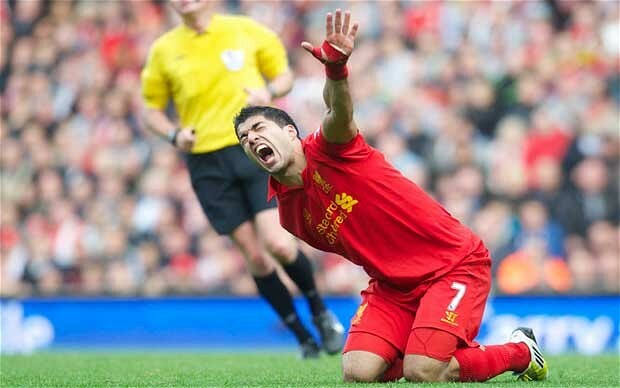 Unless you live under a rock, you also know that Suarez has had a whole host of other issues since moving to Liverpool. 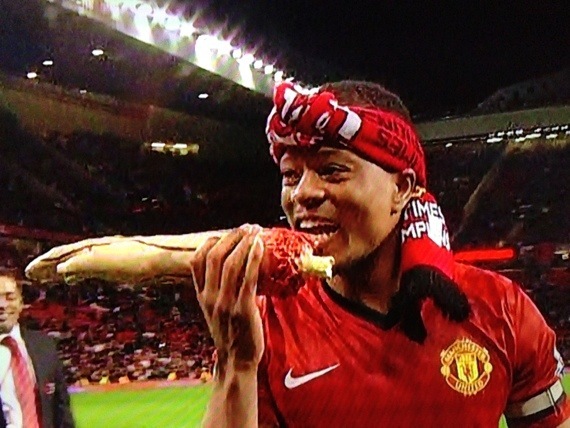 He was banned for racist comments against Patrice Evra. He’s currently serving a suspension for biting Branislav Ivanovic. (Seriously, biting!) Despite his high levels of perceived production (and inefficient or not, this year’s goal tally was really good), these other incidents have served to lower his value and cause a number of PR headaches for Liverpool Football Club. This is how I look at this situation. Luis Suarez is a poor man’s Cristiano Ronaldo. Except not the good, efficient Ronaldo like the one that played for Manchester United in 07-08. That Ronaldo was worth £80M. Instead Suarez is the poor man’s shoots-from-anywhere Ronaldo, who is worth substantially less. Alternatively, you could call that Ronaldo “Bizarro-Messi.” That type of player is actually going to be a drag on teamwide scoring. Suarez put up good numbers last year, but even then he doesn’t compare well to the other top forwards. He’s 26 now and isn’t likely to get that much better. Meanwhile, Liverpool are still in the process of rebuilding into a team that can compete regularly for the Champions’ League. You know from looking at the numbers that Suarez isn’t really in the same league as the names he’s being mentioned with and he’s also one of the biggest earners at the club. Additionally, you finally have confidence that your scouting process can produce good, efficient replacements. 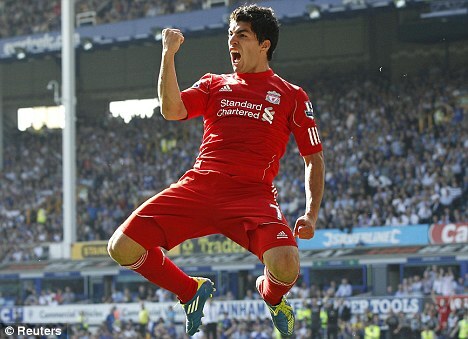 Question: What do you do if someone offers you £35M for Suarez? …and then you bite their hand off.